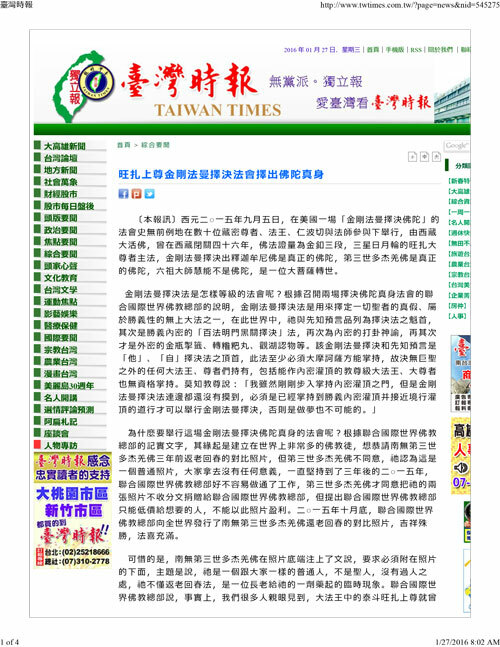 (Reported by the Taiwan Times) On September 5, 2015, an unprecedented dharma assembly of “Determining the Status of a Buddha by the Dharma of Jin Gang Fa Man Ze Jue (Jin Gang Fa Man Ze Jue is a dharma in Tibetan Esoteric Buddhism for determining the result sought through selection)” was held in the United States of America with the attendance of several dozens of venerable ones, dharma kings and rinpoches, who are from Tibetan Esoteric Buddhism, and dharma masters. The dharma practice was led by Great Rinpoche Wang Zha from Tibet, who once practiced in solitary retreat for 46 years in Tibet and has the realization of Golden Button Grade 3 (having three Sun-Moon wheels) in Buddha-dharma. 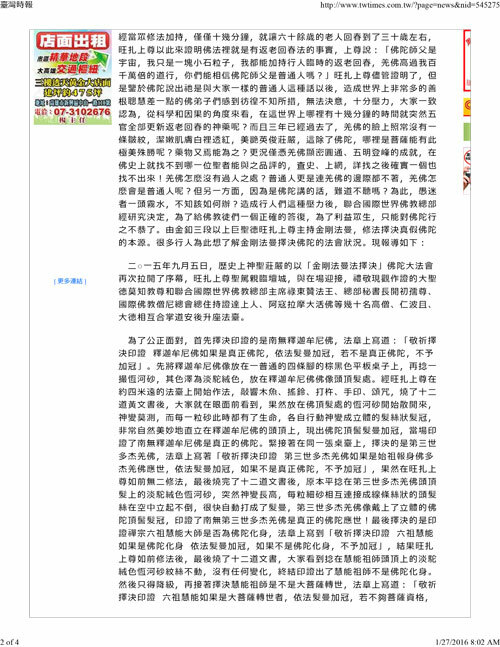 The decisions by the Dharma of Jin Gang Fa Man Ze Jue determined that Sakyamuni Buddha is a true Buddha, H.H. Dorje Chang Buddha III is a true Buddha, and Master Hui Neng, the sixth patriarch of the Ch’an (Zen) School, was not a Buddha but was the incarnation of a great Bodhisattva. Why was this dharma assembly held to determine the status of a Buddha by the Dharma of Jin Gang Fa Man Ze Jue? According to a writing describing the fact by the UIWBAH, the karmic condition rose from the fact that many Buddhists in the world wished to respectfully beseech the contrasting photos of H.H. Dorje Chang Buddha III showing His returning from an aged appearance to a youthful person three years ago. However, H.H. Dorje Chang Buddha III did not agree to that. He thought that these were just ordinary photos and were meaningless for people to have. The discussion lasted three years to 2015. The UIWBAH finally got the agreement from H.H. Dorje Chang Buddha III. His Holiness the Buddha donated the two photos of His to the UIWBAH free of charge with a requirement that the UIWBAH can only sell the photo at a low price to those who wish to get it and must not profit from selling the photo. At the end of October of 2015, the UIWBAH published the contrasting photos of H.H. Dorje Chang Buddha III showing His returning from an aged appearance to a youthful person to the world. This provided people with auspicious and magnificent feelings and abundant joy of Buddha-dharma. 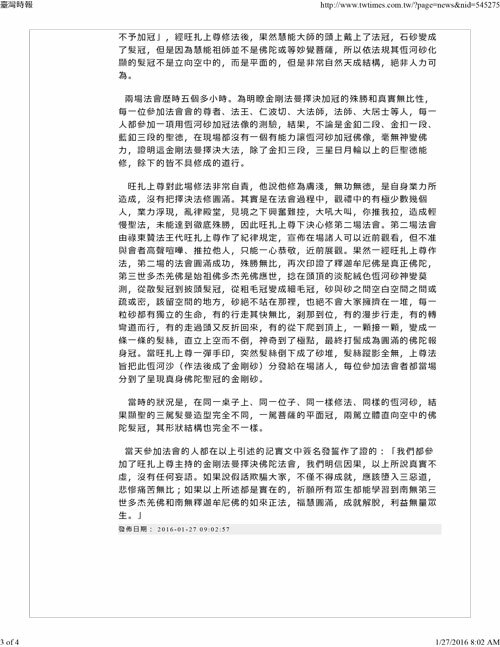 Although Wang Zha Shang Zun made the above proof, the speech by His Holiness the Buddha saying that He is an ordinary person just like everyone else made many Buddhist disciples in the world, whose good roots and intelligence are not strong enough, hesitate and be at a loss. They are unsure, with pressure on their mind. All can tell that, in terms of science and causality, how can there exists any miraculous medicine that can completely change a person’s facial features in a short period of a little over 10 minutes? Furthermore, three years have already passed and there is still not even one winkle in H.H. Dorje Chang Buddha III’s face. The skin and flesh on His face are clean and tender with a light ruddy complexion. His appearance is extremely beautiful, handsome, and majestic. Other than a Buddha, how can a Bodhisattva have such extremely beautiful magnificence and how can any medicine create such an effect? Additionally, H.H. Dorje Chang Buddha III’s accomplishments of perfect mastery in both exoteric Buddhism and esoteric Buddhism and at the acme of the Five Vidyas are unmatched and incomparable by any holy one throughout the history of Buddhism. Not even one can be found from looking through history, searching the internet, and exhaustive investigations! How could H.H. Dorje Chang Buddha III not have advantage over others? Ordinary people do not bear any remote resemblance to H.H. Dorje Chang Buddha III. Then, how could H.H. Dorje Chang Buddha III be an ordinary person? On the other hand, should we not listen to His Holiness the Buddha’s speech? Therefore, unintelligent and deluded people feel muddle-headed and do not know what is right. 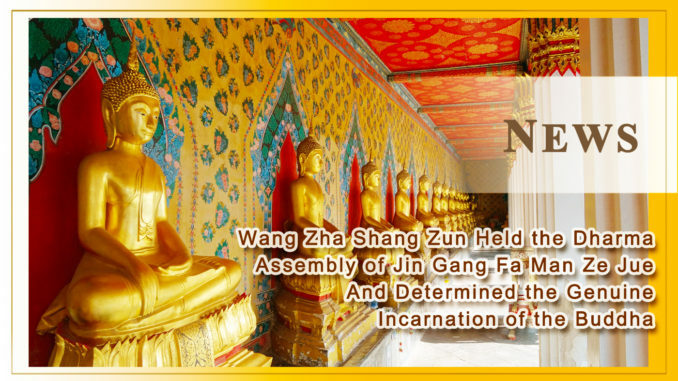 On September 5, 2015, the historic grand dharma assembly to determine the status of the Buddha using the Dharma of Jin Gang Fa Man Ze Jue began in a solemn and majestic scene. Wang Zha Shang Zun’s holy arrival was welcomed by Great Holy and Virtuous One Mo Zhi Jiao Zun, Chairman of the UIWBAH Dharma King Gar Tongstan, UIWBAH’s Secretary General Kai Chu Ru Zun, Chief Abbot of the International Buddhism Sangha Association Dharma Master Zhengda, Great Rinpoche Akou Lamo, and several dozens of eminent monks, rinpoches, and dharma masters who were to serve as observing witnesses. They held palms together to greet each other and were seated on the dharma rostrum. To be fair, the decision by selection was first conducted to verify the status of Sakyamuni Buddha. The beseeching dharma document wrote, “We respectfully beseech a verification from the decision by selection. If Sakyamuni Buddha is truly a Buddha, a crown made by strands of hair will be put on the head. If not, there will be no crown.” First, a portrait of Sakyamuni Buddha was laid on an ordinary four-legged flat table of dark-brown color. Then, a pinch of sand from the Ganges River with the color of light camel wool was picked up and put on the portrait at a spot of hair at the top of the Buddha’s head. Wang Zha Shang Zun began to practice the dharma at a dharma rostrum which was about 13 feet away from the table. After the ritual of knocking the wood fish, ringing the bell, waving the Vajra, performing mudras, and chanting mantras, twelve documents written on yellow papers were burnt. All observing witnesses saw with their own eyes that the sand placed at the spot of hair at the top of the Buddha’s head began to disperse with inconceivable changes. Every grain of sand seemed to be alive. All sand grains moved individually with miraculous transformations to form a crown made of strands of hair, which very naturally and wonderfully stood up above the top of Sakyamuni Buddha’s head. A scene of adding a crown of strands of hair to the Buddha’s top-knot was manifested, proving that Sakyamuni Buddha is a true Buddha. Immediately after and on the same table, the decision by selection was conducted for H.H. Dorje Chang Buddha III. The beseeching dharma document wrote, “We respectfully beseech a verification from the decision by selection. If H.H. Dorje Chang Buddha III is the incarnation of the primordial Sambhogakaya-Buddha Dorje Chang Buddha, a crown made by strands of hair will be put on the head. If not, there will be no crown.” Wang Zha Shang Zun practiced the dharma following exactly the same ritual as before. After the twelve documents were burnt, the sand of the Ganges River with the color of light camel wool that had been flatly put on the spot of hair at the top of H.H. Dorje Chang Buddha III’s head suddenly had the miraculous transformation of being elevated upward. Sand grains connected with each other to form strands of hair standing in the air. The strands of hair then automatically formed a crown of hair. A 3-dimensional crown was put on the head of H.H. Dorje Chang Buddha III in the portrait, proving that H.H. Dorje Chang Buddha III is a true Buddha coming to the world! The last decision by selection was to verify whether the Sixth Patriarch Master Hui Neng was a Buddha’s nirmanakaya (meaning emanated body). The beseeching dharma document wrote, “We respectfully beseech a verification from the decision by selection. If the Sixth Patriarch Master Hui Neng is a Buddha’s nirmanakaya, a crown made by strands of hair will be put on the head. If not, there will be no crown.” As before, Wang Zha Shang Zun practiced the dharma following the same ritual and the twelve documents were burnt. Everyone saw that the sand of the Ganges River with the color of light camel wool placed at the top of Patriarch Master Hui Neng’s head had no movement or change at all. Therefore, the conclusion was that Patriarch Master Hui Neng was not a Buddha’s nirmanakaya. So a lower-level status had to be verified by the decision by selection, i.e. to determine whether Patriarch Master Hui Neng was an incarnation of a great Bodhisattva or not. The beseeching dharma document wrote, “We respectfully beseech a verification from the decision by selection. If the Sixth Patriarch Master Hui Neng is an incarnation of a great Bodhisattva, a crown made by strands of hair will be put on the head. If he was not at the level of a Bodhisattva, there will be no crown.” After Wang Zha Shang Zun practiced the dharma, a dharma crown was put on Master Hui Neng’s head. Sand grains formed a crown of hair. However, because Patriarch Master Hui Neng was not a Buddha or a Bodhisattva with universal or wonderful enlightenment, as stipulated by the dharma, the crown of hair did not stand up into the air and become a 3-dimensional crown, but was formed on a flat plane. However, it was very naturally structured and absolutely not something that can be made by humans. The two sessions of the dharma assembly lasted more than five hours. To show the magnificence and extremely truthful nature of the crowning process through determination by the Dharma of Jin Gang Fa Man Ze Jue, each of the venerable ones, dharma kings, rinpoches, great dharma masters, dharma masters, great laypersons, and others attending the dharma assembly took a test to crown the visage using the sand from the Ganges River. As it turned out, none of the holy and virtuous ones present who are at the levels of Golden Button Grade 2, Golden Button Grade 1, and Blue Button Grade 3 were able to crown the Buddha’s portrait with sand from the Ganges River. There was no manifestation of power of Buddha-dharma to cause miraculous changes. This proved that the great dharma of Jin Gang Fa Man Ze Jue can only be practiced by extremely great holy and virtuous ones at the level of Golden Button Grade 3 or higher. No one else possesses the realization to practice the dharma successfully. Wang Zha Shang Zun was very dissatisfied with himself for the first session. He said that his cultivation was shallow and lacked merit and virtue and that his own karmic forces caused him not to practice this dharma of decision by selection perfectly. The reality was that a few people in the observing crowd had their karmic forces become visible during the dharma assembly. They caused disturbance in the Buddha hall when they could not control their excitement upon seeing holy states. They shouted loudly and pushed others. Such disrespect toward the holy dharma kept the outcome from being completely perfect. For this reason, Wang Zha Shang Zun decided to hold a second session of the dharma assembly. Before the second dharma assembly started, Dharma King Gar Tongstan made the rules on behalf of Wang Zha Shang Zun. He announced that onlookers could get closer to watch but no one was allowed to speak loudly or push others. All must have the mind focusing on being respectful before moving closer. Then Wang Zha Shang Zun practiced the dharma. The second dharma assembly had a perfect success with extremely magnificent manifestations, proving again that Sakyamuni Buddha is a true Buddha and H.H. Dorje Chang Buddha III is the incarnation of the primordial Sambhogakaya-Buddha Dorje Chang Buddha. In the process, the sand of the Ganges River of the light camel wool color placed at the top of the head exhibited unimaginably miraculous transformation. A lose-hair crown changed into a head-covering crown and a thick-hair crown changed into a thin-hair crown. The strands of hair gathered or separated as required at different places to knit into a naturally perfect crown. Every sand grain had its own independent life. Some walked extremely fast; some wandered around casually; some followed twisted paths; some traveled past the boundary and then came back; and some climbed from the bottom to the top. The sand grains followed each other one by one to form strands of hair that stood into the air without falling. Eventually, a knot was formed to create a perfect crown for the Sambhogakaya-Buddha. Then, Wang Zha Shang Zun snapped a finger to perform a mudra and the strands of hair fell into a pile of sand with no trace left of the crown. Wang Zha Shang Zun issued a dharma decree to distribute the sand of the Ganges River (which became Vajra Sand after the dharma was performed) to all who were present. Every attendee received a share of the Vajra Sand that manifested the holy crown worn by the genuine incarnation of the Buddha. The situation at the time was that the dharma was practiced with the same table, at the same position, following the same ritual, and using the same sand of the Ganges River. However, the three hair crowns created were completely different. There was one Bodhisattva two-dimensional crown and there were two Buddha hair crowns that were three-dimensional and stood into the air. The latter two were also different from each other in terms of shape and structure.